How do you develop business? 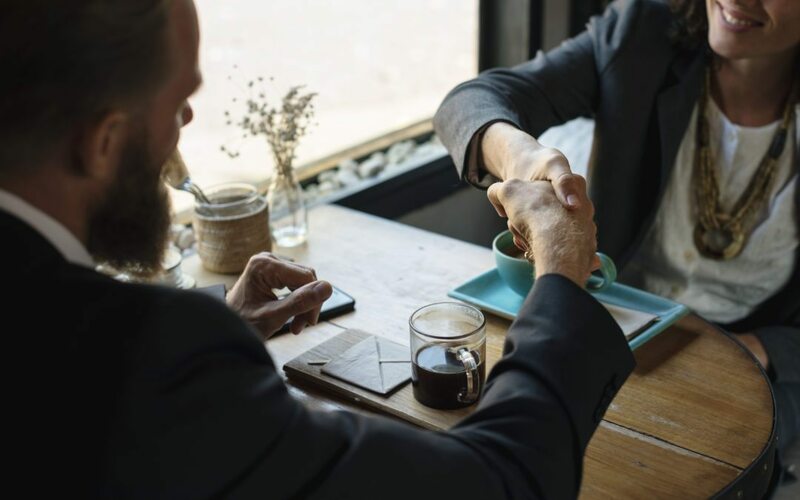 As many service providers have learned, professional networking can lead you toward developing referral partner relationships with people who send you new clients. A loyal client’s lifetime value can be incredibly high, and the referrals that they provide can help your business thrive. The probability that you close business with someone who was referred is much higher than meeting a random prospect. This is due to the endorsement that is generally given by the person making the referral. Common sense tells us to continue networking to grow our businesses. It’s that easy, right? No, it’s not that easy and never will be due to supply/demand, saturation, and many other things keeping the average provider from making a lot of money quickly. How many insurance agents do you know, for example? Mortgage lenders? Realtors? However, how many do you know who grew up in Minnesota, went to USD, played Rugby, belonged to whatever fraternity, and enjoy paddle boarding? Why do hobbies and traits matter in relationship building? If you’re new to sales, you might have been given some training, but most likely you’re handed a phone and told to go find new clients. Insurance agents, mortgage lenders, business coaches, wealth managers, realtors, consultants – we all work hard to find a business development channel that works for us, but when it comes to professional networking, gratification may not be immediate unless you get really lucky and stumble into someone who for some reason likes and trusts you; and for this to matter from a business perspective, this random person needs to have a client or contact in need of your services. Are you an advisor or transactional in nature? Think Wealth manager earning advisory fees in their sleep, vs Realtor selling a home splitting their fee with the agent on the other side. The lifetime value and stability of the advisory client is exponentially higher than the client purchasing a home unless they’re flipping. Why not spend time figuring out exactly what you’re after? Are you after business clients or individuals? Are you an Insurance agent building an annuitized income stream based on client loyalty, or are you an investment banker working on a fee basis per transaction? It helps to pinpoint your client type and really define the ideal situation for yourself and your business. It’s very easy to fool yourself into thinking that “ACTIVITY EQUALS RESULTS” but think about that for a second. Activity is necessary, and the harder we work the luckier we get, right? OK, but let’s talk about working SMARTER. Most of us will then spend countless hours trying to identify and nurture relationships with referral partners. The identification process may involve cold calling, but more likely you’ll spend countless hours attending professional networking meetings, wandering around trying not to uncomfortably stare too long at people’s name tags in hopes of meeting someone in a field complementary to yours. Let’s say that you do happen to see someone wearing a name tag that indicates they could be a good referral partner and maybe even nice to talk with. From there, it’s a matter of hoping that they aren’t already engaged in a conversation that you’d need to interrupt, and then spending a few minutes determining whether this person is a likely referral source. Things that go through my mind as I’m doing this are: does this person have the right client type? Are they located in an area that would be geographically complementary to my clients? Do I get a sense of integrity, professionalism, and likeability? Would their chemistry match well with any clients that I might send to them? Lots of moving parts and this can be an overwhelming process that most of the time leads to nothing. Sound familiar? Forget about the one-hour network meetings and group events. Think about the time you waste traveling to the coffee shop to meet the week after, only to learn that you’re the likely referrer, not the beneficiary. We’ll get to RECIPROCITY later but first, let’s discuss the LIKEABILITY factor. How is it that we tend to attract referral partners and clients who have similar backgrounds or personalities? Introvert/extrovert, easy going, Type A, athletic, hobbies, ethical, analytical, professional, well-dressed, on time, good listener, giver/taker? There are so many variables that can be explored in this discussion, but my point is this: why do you think efficient relationships form? Timing, chemistry and client type are three main items that I’ve learned to be conscious of. Think about it; you meet someone randomly and ask a few questions – the conversation quickly turns uncomfortable due to chemistry or whatever makes people be guarded. However, how often is it that you learn something about a person that immediately increases the LIKEABILITY FACTOR? They were a Navy SEAL, attended the same college, grew up in the same area, enjoy the same interests that you do, values, beliefs, etc. 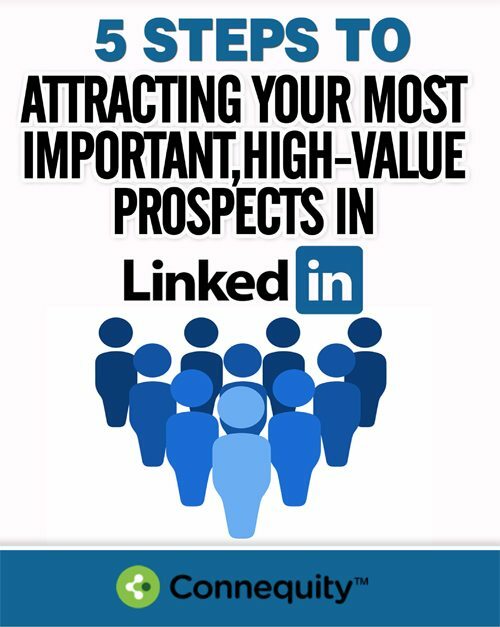 Think commonalities and traits – when you learn something intriguing, or you recognize common ground, the LIKEABILITY FACTOR becomes evident, and you’ve potentially found yourself a new referral partner – assuming they have the right client type… quite critical, unless you’re just out to make friends. Why not use math and science to interconnect service and sales professionals? Develop a system that aggregates commonalities, then using an algorithmic approach – automatically match complementary professionals with a higher likelihood of engaging? Take the legwork out of the introduction process. There will always be a need to meet and determine whether a person is likable, trustworthy, and professional but why spend so much energy when you have a system that will do it for you? Everyone asks how this is different than LinkedIn, which suggests “People You May Know”. Connequity is about purpose and definition. Think LinkedIn meets eHarmony, meets Netflix recommendation engine. Anyone developing business will quickly learn that efficiency and productivity go hand in hand, and effective tools can literally change the game for the professional seeking to leverage their activities. Connequity is an online accelerator for professionals that provides relevant introductions and referral relationships. The company is headquartered in San Diego, with members nationwide.